The living room is one of the most used rooms in the house so the style and design of it should be of high importance. Whether you like the boho look or favour a more modern and contemporary style, here are 10 different beautifully designed living rooms, and the reasons why they all work. This gorgeous bohemian style living room combines a mixture of looks to create a beautiful chic space. The light color of the sofa, chairs and walls provide a clean look, while the vibrant pop of color from the rest of the furniture gives the living room personality. The simple design of the sofa contrasts beautifully with the Morrocan style coffee table which acts as the centerpiece of the room. 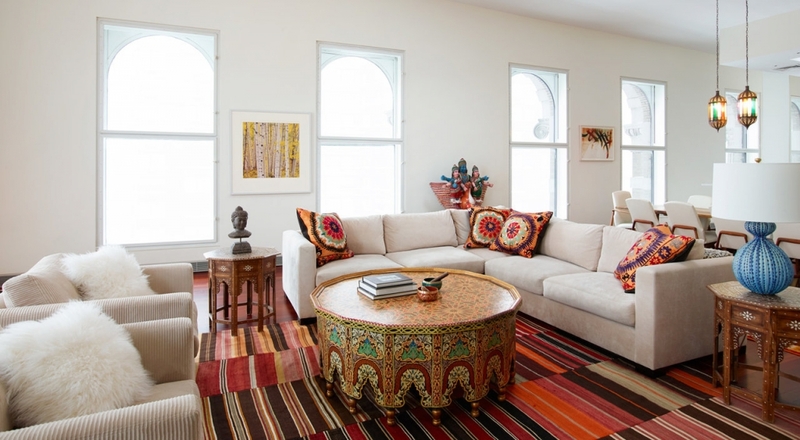 The warm colors of the striped rug and cushions also tie in with the boho look, while the windows are large enough to provide plenty of natural light. The simplicity of this room makes it easy to redecorate if you ever wanted to give it an update, but why would you? Beautiful wooden flooring and a natural wood table gives this space a rustic feel, which is further enhanced by the stag wall art. 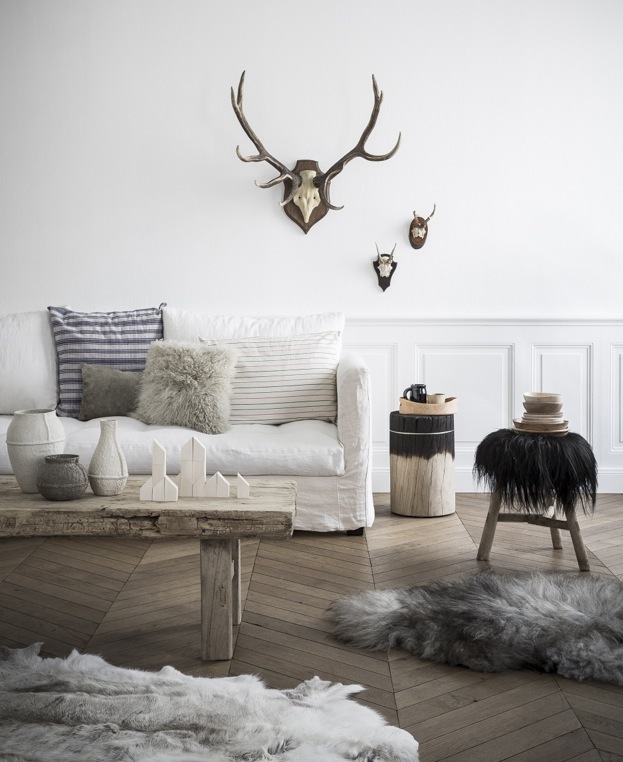 A collection of furry rugs and cushions create a cosy atmosphere, and also stand out against the all white color scheme. 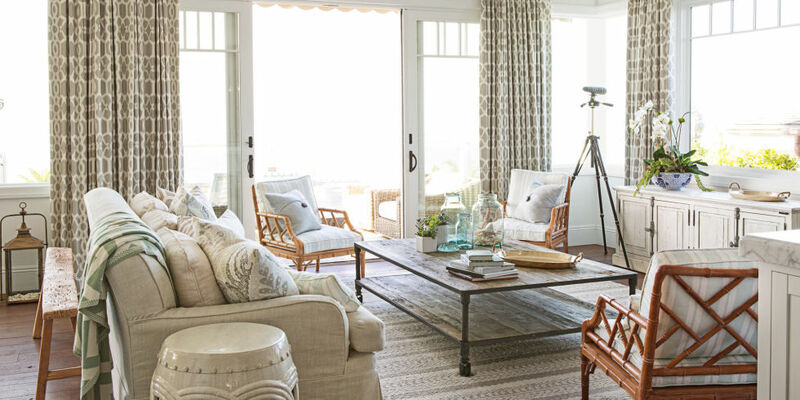 The use of neutral colors creates a calm beach style atmosphere in this living room, while natural light shining through the patio doors and wide windows helps brighten up this space. To prevent the room from looking too bland, mutual patterns are featured on the rug, curtains and cushions in complementary colors to create visual interest. The modern design of this living room oozes glamour and elegance. From the tranquil colors of the walls and furniture to the rich gold tones of the tables and the cabinet, the room looks both stylish and inviting. 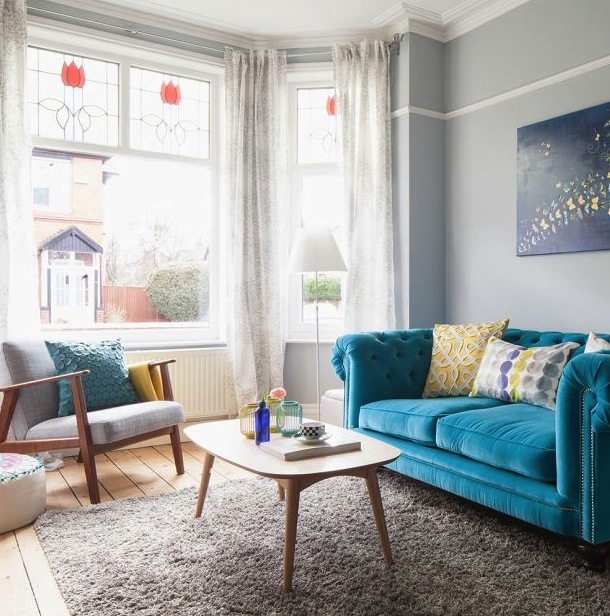 Symmetry is believed to create a harmonious atmosphere, and this has been reinforced with the use of matching mirrors and lamps either side of the velvet sofa. To finish off the modern artistic look of this room, the flooring features a sophisticated pattern, while an unusual eye catching piece of art is hung up on the wall. 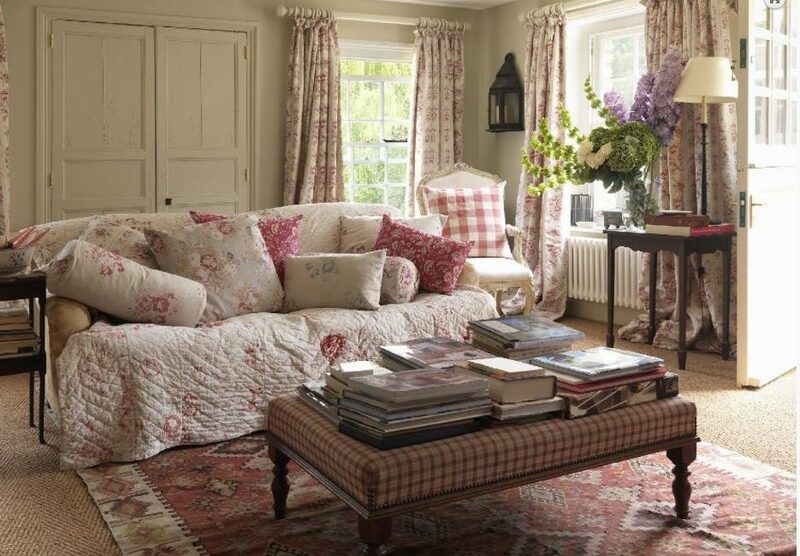 With its pretty floral prints and gorgeous pink hues, this cosy living room is very feminine. The walls are a warm neutral color, which works well with the combination of gingham and floral fabric. Heavy floor length curtains frame the windows beautifully and match the throw and cushions over the sofa. A large throw makes any room look cosy, and are a great way to protect the fabric of your sofa, especially when you have children. To add to the homely and relaxed feel of the room, a stack of books have been placed on the coffee table. The light and bright decor of this living room makes this space appear very open and inviting. White walls and furniture give this room a clean look, while the textures of the sheepskin throw and the carved pieces contrast beautifully to create a contemporary yet rustic charm that really stands out. A large cream sofa featuring several cushions on top gives the room give a cosy feel, which is enhanced by the large rug that covers up most of the wooden flooring. This living room boasts a large personality with its use of bright and bold colors. Muted tones of grey are used for the walls, rug and pieces of furniture such as the table and chair to allow the colorful pieces of furniture and accessories to stand out. Despite the wide range of colors, you will notice there are at least two items of each color so nothing looks out of place. For example, the stool and vase are a beautiful turquoise blue, while the flowers and chair to the left are both green. To tie in all of the colors together, a white canvas featuring splashes of several colors is hung up above the fireplace. This child-friendly living room is incredibly stylish but manages to be suitable for the whole family. Both sofas have a very simple but classic design which is dressed up with patterned cushions that add a pop of color to the room. The minimalist style means your eyes will be immediately drawn to the center of the room which features a patterned rug and beautiful accent coffee table. To accommodate the children, a space has been created especially for them on the right hand side. It features a craft table matching the same color of one of the sofas, along with two brightly colored chairs. Above the table the neutral colored wall has been dressed up with photographs and children's drawings which adds more color to the room and provides a nice decorative feature. The large use of this vibrant shade of green truly brightens up the living room. Green walls evoke a sense of fun, which is complemented by the green accessories in the room including the cushions, apples and plants. To make the green stand out and become a focal point in the room, the sofa is kept a subtle shade of cream, while the coffee table is also a neutral tone. 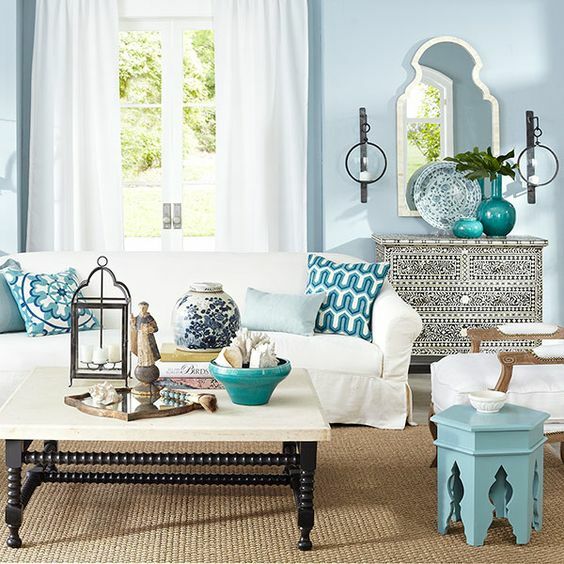 The bold turquoise sofa and cushion gives this neutral looking living room a stylish pop of color. 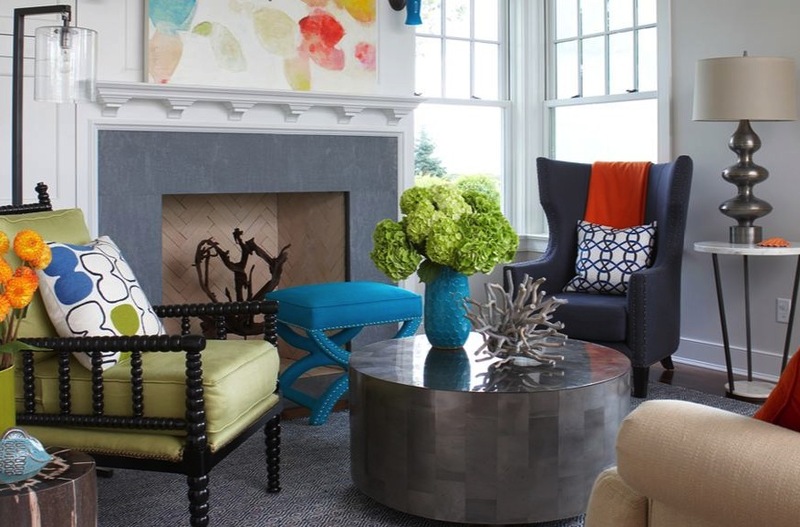 Further elements of color are placed around the room to liven it up including a yellow cushion and blue and yellow jars on the coffee table. To create a calm atmosphere, the rug is a tranquil shade of grey, while the fluffy texture of it adds a sense of cosiness to the room.